Cooking is one thing that Andy and I love to do together. Although he’s is constantly asking me for directions, we work amazingly well together in our small kitchen. He has gotten used to following my instructions and online recipes to prepare the necessary ingredients for our meals while waiting for me to get home. Today, I can’t help but to realize how blessed I am to have him in my life. Our wedding anniversary is in about 6 weeks and it has been a great year living together thus far. Here’s what we cooked up together this lovely Sunday evening. I chanced upon this simple and healthy recipe while browsing on one of my favourite daily reads, ApartmentTherapy.com. Their sister site is called The Kitchn, and I love reading it for simple and inspiring ideas in and out of the kitchen. Cut the broccoli into small florets and steam on the stove or in the microwave with the 2 tablespoons of water. Season lightly with salt and pepper. Heat a drizzle of olive oil in a large sauté pan. Cook the onion and garlic until it just begins to soften then add the broccoli. Cook for several minutes or until the onion turns translucent. Add the parsley and cook until it’s well wilted. Pour in the lemon juice and simmer for about two minutes. Taste and add any necessary additional salt and pepper. Serve with a good ridged pasta. (I used wholewheat penne instead). Garnish with extra crumbled feta and lemon zest. 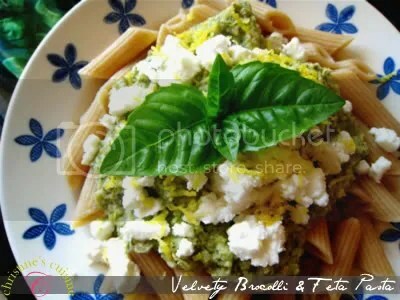 This entry was posted in General Western, Italian and tagged brocolli, feta, food, pasta. Bookmark the permalink.